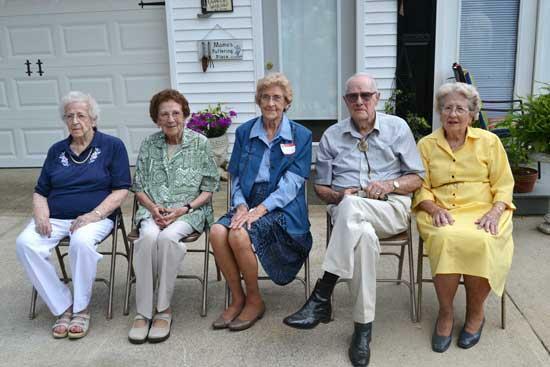 (L to R) Honored Guest – Lillie Dale Willard, Mattie Drue Nichols, Alberta Griffith, Dr. Frank Willard and wife Katherine pose during the 2011 Willard Family Reunion held in Lebanon at the home of Paul and Judith (Judy) Van Hook. Celebrating 91 years of life, Mattie Drue Willard Nichols, was surrounded by family on July 24 as several generations of Willard descendants met for the first time in two years for the 2011 Willard Family Reunion. Held in Lebanon at the home of Ms. Nichols’ daughter, Judith (Judy) and her husband, Paul Van Hook, other honored guests were Lillie Dale Willard, age 88, who traveled from Tullahoma with her sister Alberta Willard Griffith, 85, of McMinnville. Their 94-year- old brother, Dr. Frank Eagleton Willard and wife Katherine attended from Clarksville for a pleasant day of reminiscing and fellowship with family and friends. The Willard families of Tennessee are descendents of Beverly Willard who migrated from Virginia around 1803. He and his family settled on Hurricane Creek near Auburntown, but the exact location was not known until March of this year. Using an 1803 land deed and an 1808 land grant, Danny Nichols, son of Mattie Drue Nichols, challenged his brother William Edward (Eddie) Nichols to locate the Beverly Willard property. During the winter of 2010, Eddie studied these land documents along with approximately 300 deed transfers. By creating map overlays to plot surveyed tracks of land and eventually walking boundary measurements, the original Beverly Willard homestead was located. Mattie Drue Nichols is named after her grandfather and grandmother, Matthew (Matt) and Drucilla Odom Willard. Matt’s father, William Willard, relocated to Freestone County, Texas, around 1870. However, Matt had already found his one true love -- Drucilla Odom of Hurricane Creek. He returned home to Tennessee to marry her, and they farmed in the foothills of Milton and Marshall Creek in Cannon County. Over the years, however, Matt Willard made 11 round trips by horseback to visit Texas kinfolks. Each journey involved more than 1,600 miles. The Willard descendents now number over 8,000 in 16 states and one foreign country. In October 2005, Danny Nichols began updating the Willard family history begun by Frank Willard in 1960. The Internet enabled Willard cousins to locate each other and combine materials and research. This six year effort resulted in a work entitled, “The Beverly Willard Family of Virginia and Tennessee.” A CD with the collective Willard family history is being published and pre-orders are being taken to reserve copies.